Here's a transit corridor where light rail would be almost impossible. Picture a two-lane road winding through residential and commercial areas. Grades of 10% are common and space for any "conventional" rail system doesn't exist. What we've described is the Shonan corridor, which runs from the Ofuna rail station to the coastal area of Enoshima (20 miles southwest of Tokyo). It is the first operational system in the world based on the French-developed Safege monorail. The original Safege test track is featured in the 1960's film "Fahrenheit 451." The rubber-tired bogies run inside the steel beamway. Switches are extremely important with the Shonan system, in that the trains run in both directions on the single beam at all times. Passing is accomplished at stations, where the beams split to both sides of the platform. Timing is extraordinary, and it has operated since 1970 flawlessly. From purely an enthusiast's point of view, this monorail is one of the most fun to ride anywhere. There is a sensation of a smooth flight through trees and above the traffic jams below. A couple of tunnels through hills add to the experience. 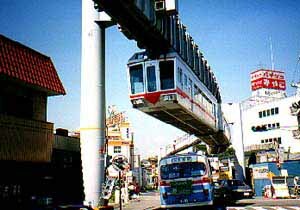 A three-page photo essay of the Shonan Monorail is in Special Features.